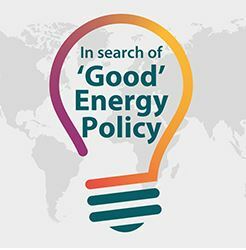 DEMAND Research Fellow, Sarah Royston, was invited to give a talk as part of the interdisciplinary lecture series ‘In Search of ‘Good’ Energy Policy’ at the University of Cambridge. Sarah introduced the main points of her lecture here, and the full seminar audio can be found here. Royston, S., Selby, J. & Shove, E. (2018) Invisible energy policies: a new agenda for energy demand reduction. Energy Policy, 123: 127-135.